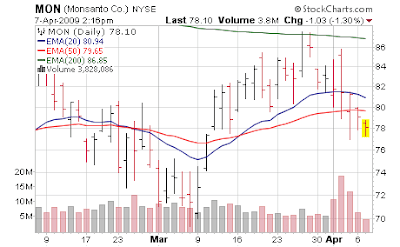 I am closing Monsanto (MON) at this time as the chart is not correlating with the solid fundamentals. I will book about a 3-4% loss on this last batch and we'll revisit the position later when the chart firms up. At this point, I am going to (big leap of faith) assume we won't be crashing and am trying to run my mainline strategy of long/short stocks. This strategy is actually nearly impossible to run in a market where every stock is blessed or hated as we've been doing since September 2008 (with exception of December). Going on 8 months now - it's been far more important to throw a dart and guess which way the market is going then knowing anything about individual stocks or sectors. Very atypical and very difficult to manage. Seeing bad stocks run up 150% in 5 days as the pants of shorts are lit on fire is bemusing at times, but we are disassociating facts with stock movement. I always say stocks do not trade in a vacuum even in calm markets, but in this era the vacuum - not the individual stocks - is everything. That said, with financial Armageddon taken off the table, all we have to deal with is the Great Recession offset by the Great Paper Printing. I have no clue how this works out because there is no framework, no precedent. I expect all assets to be inflated (including stocks) over where they belong due to the Great Paper Printing but the true economic issues affecting Main Street won't be helped much. While I do expect another retest and/or surge down "later" in the year I am not sure it will be right away as "faith in government to save us" is the current ethos. So with that said, I am adding to positions in good charts that have pulled back - again we take an incremental approach - so much of this today is replacing what i sold last week - some names included First National Financial (FNF), Myriad Genetics (MYGN), Potash (POT), BHP Billiton (BHP), Quality Systems (QSII), Blackstone (BX), Morgan Stanley (MS) and a touch of Baidu.com (BIDU). As I've done this, I've dropped my ETFs which were giving me the long exposure I lacked when I punted portions of these positions last week into the rally. I'd like to buy all those names lower (as long as their charts stay in good shape) as well as seeing significant drops in names such as Gafisa (GFA), HDFC Bank (HDB), Allegiant Travel (ALGT), Ocwen Financial (OCN) and the like which have run, run, run and are nowhere near any support. I have very tiny positions in these awaiting a serious pullback to add. To balance this I did add to shorts in Commercial Real Estate and frankly a lot of consumer related names/retail stores - really are looking appealing now that shorts have been eviscerated in those stocks. So overall, incrementally building individual long positions on pullbacks, and doing the same in individual short positions to create a more balanced approach. In a normal world I'd have positions as 4-6% stakes, everything has been cut by 1/2-2/3rds in size since the the market moves are so vicious. I am hoping we get some times of calmer action instead of 2-4% up or down each day. Ridiculous fact of the day - a "bull market" (or bear) is technically a 20% move. Since fall 2008 we have had TWO full bear markets, and TWO full bull markets. That's obscene but shows you how material the moves have been. What used to take 8-36 months now happens in 8-36 sessions. This is why the trading has been frenetic... the time compression is incredible - positions that used to take months to build are now over with in "6 days".